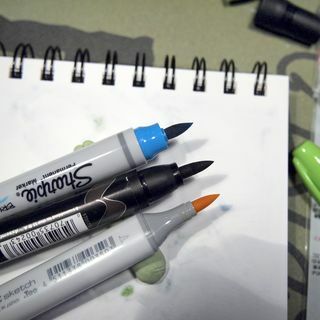 After a brief hiatus the art adventures are back on! This week Jane and I headed to the MFA in Boston to see the (new to me) Art of the Americas wing. It’s pretty darn sweet. It also renewed my interest in some of the more modern American painters. ONe of my favorites has always been Edward Hopper for his street scenes. It is directly in line with the sort of photography I’ve been doing lately as well as the paintings I’d like to produce. From our trip Jane and I discussed a lot of things; that we miss having critiques because they push you to do more; we miss some structure of classes and assignments, to that end we’ve given ourselves an assignment (I’ll discuss this later); additionally we miss making art adventures. We already decided that we’re going to meet again in 2 weeks. The assignments are going to have a theme but that’s it. We can work any size and any medium as long as we stick to the theme. 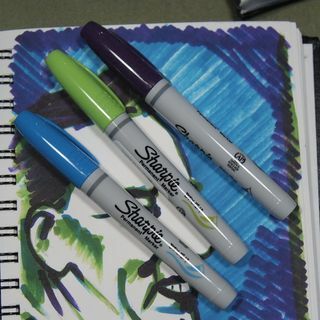 This week’s theme is pretty easy, “Create a piece inspired by our visit to the MFA.” It couldn’t get much more open than that, given that we looked at work on paper, sculptures, drawings, photography, and stuff from all time periods. So far I’ve decided I’m going to go with a painting of a local business Hooper inspired, probably China River or Super Chicken and most likely work in acrylic on stretched paper. I haven’t figured out size yet, but that will come with time. 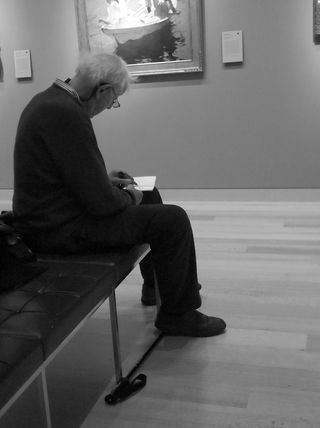 I leave you with this guy drawing in the MFA, I'll scan some of my drawings from our coffee sessions and from the train station. 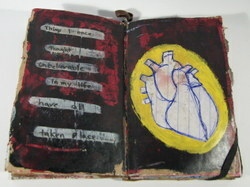 This entry was posted in Inspiration and tagged art, boston, inspiration, MFA, painting, theme, week, work on 20110925 by leslie. I got a camera to help me take shots of the places I take my pochade box, so that I can better finish the piece when I get home. It’s rare that any one piece is 100% finished outside. I find a lot of the advice given for photography is similar to that I’ve received for painting en plein air. 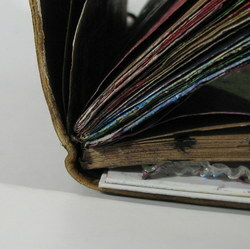 #3 Look at lots of art/photos, good and bad, you can learn a lot just by looking. #6 It’s all been done before except for your vision. 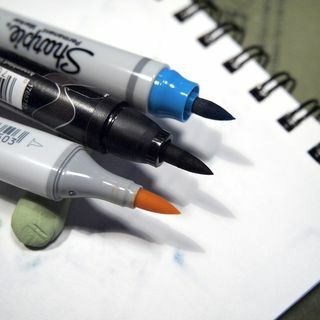 This entry was posted in Art Habit and tagged advice, art, cult of stuff, en plein air, painting, photo, pochade on 20110627 by leslie. 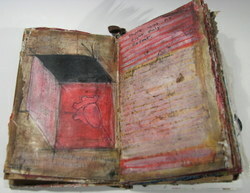 This entry was posted in Uncategorized and tagged art, draw, how, journal, journaling, painting, sketchbook, technique, to on 20091031 by leslie. I’ve been quite disgusted with this whole steroids in sports controversy. What disgusts me more is that my tax dollars are going towards investigating it. I’d rather have my money spent on kids in schools than knowing is Clemens infact took steroids. Perhaps Clemens should pay for the investigation with a couple mill of the money he’s made pitching. 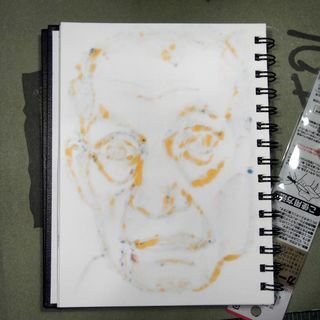 I made a sketch in my sketchbook of this first. I’ll load up some pics of that later. 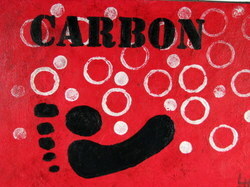 I was discussing the idea of a carbon footprint with someone the other day and this image came to mind. 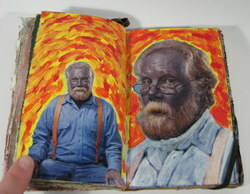 You might remember this image from my sketchbook. I’m putting both of these up on etsy, you can find them here. 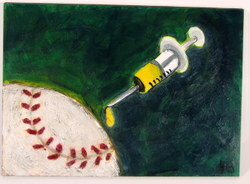 This entry was posted in Uncategorized and tagged art, baseball, carbon, craft, footprint, illustration, journal, life, lifebook, painting, steroids on 20080210 by leslie. Immediately after finishing my last hedgehog/ moleskin I started a new one. This one has distressed brown and black sheep hide covers, is 3.5×5.5 in size and was entirely hand made by me. It got kraft paper pages which is something new for me to work on. 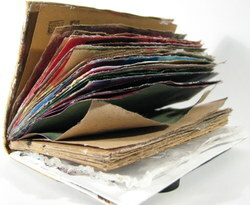 I used rough wrapping paper kraft paper for the pages too so it has a great texture for drawing and such. After you get done looking at these pictures head on over to my Flickr account and see more pictures. I didn’t load them all here because it takes longer but at flicker you can see all the spreads thus far that are in the book. 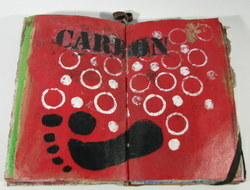 This entry was posted in Uncategorized and tagged art, collage, craft, drawing, handmade, hedgehog, journal, lifebook, paint, painting, sketchbook on 20080126 by leslie. 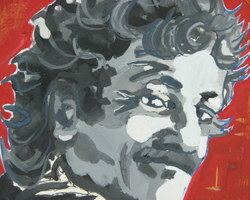 I’ve been a big fan of Kurt Vonnegut for years, since I first read Breakfast of Champions when I was a freshman. 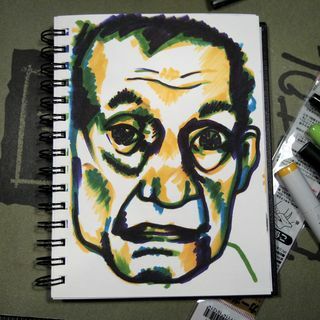 I was very sad when I heard that he had died this past year. 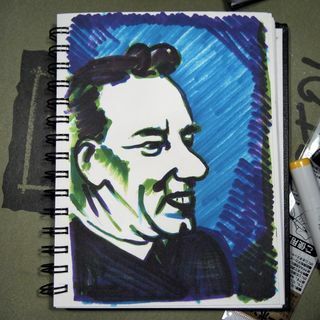 I commemorated him with a portrait. I’ve listed it on etsy. Here are a few pictures, but you can see it on etsy here. 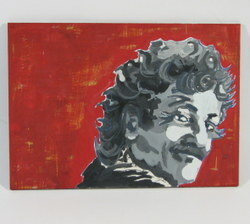 This entry was posted in Uncategorized and tagged art, craft, drawing, handmade, kurt, painting, portrait, vonnegut on 20080114 by leslie.